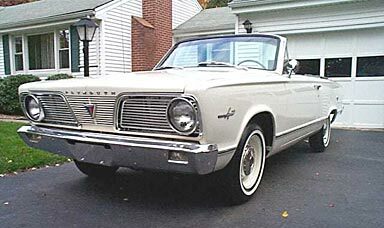 "My preoccupation with old cars and my Valiant in particular began in the early summer of 1998. I had been interested in classic cars for a while, going to various car shows in my area as a spectator. I had hopes of someday owning a classic myself, the only problem being I liked all types of old cars. I decided a convertible would be nice since I've never owned one myself but do remember riding with a co-worker in his mid 60's B-body convertible (can't remember the exact model). 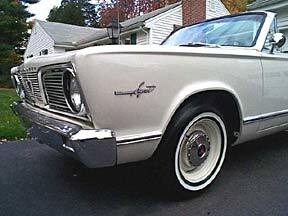 I started searching the online classified and came across a '67 Barracuda convertible with a rebuilt engine, new paint and interior for $4000. Since the car was about 50 miles from my home I decided to take a drive and check it out. Pulling up to the house, I could see the '67 Barracuda sitting in the driveway. My heart sank. The paint was horrible, looked like it had been painted with spray cans. The “new” interior had a cracked dash pad that was melted together into a big blob. The owner opened the hood for me and I was shocked to see holes rusted through the cowl large enough to put my fist through! The owner then claimed the engine "must have been" rebuilt because it ran so well. After much difficulty he was able to get it started, it sounded terrible. He offered to let me take it for a test drive. I graciously declined and left, saying the car needed too much work. 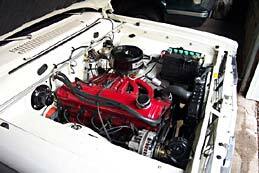 "I continued searching the local classifieds and came across the car I now own, a 1966 Valiant Signet convertible, 225 slant 6 and automatic. The owner e-mailed me and said to his knowledge the car had no serious rust problems, ran a little rough (needed a valve job) and was driven on a regular basis. I took a ride over to check the car out and took it for a test drive. It was a sunny day and the top was down. It was great. He wanted $1500, I left a $100 deposit and the owner agreed to deliver the car to my home the following day. 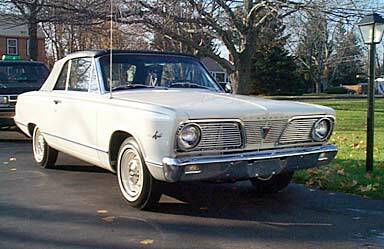 "The Valiant arrives, we conclude the transaction and I can't believe my good fortune. After the previous owner leaves, I start checking the car over to see what repairs might be needed. I was about to get a rude awakening and an education in the "hobby" of classic car ownership. Lesson number 1, never shop for an old car without someone who's been there before, especially if you're new to the hobby. 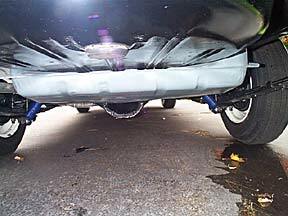 The first thing I found was the rear wheel well openings were packed with about 2" of body filler. Then I pull the carpet back and saw holes through the floor. 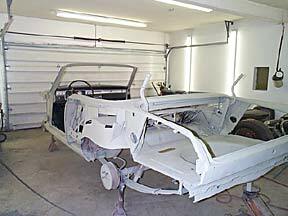 The lower front fenders are filled with Bondo, the tops of the front fenders are filled with Bondo, the car won't start without a shot of starting fluid, the rear springs are coming through the trunk floor, the passenger's side torsion bar support is rusted, etc... I was depressed. I thought about donating the car to a charity and taking a tax deduction. "Then a friend of mine, who had restored a '55 Chevy Belair and a '66 Nova, put me in touch with a bodyman (actually, he builds all steel street rods from scratch!) who agreed to take the car in and pick at it in his spare time. I borrowed a repair license plate and drove the car 30 miles to his shop. It was dark out and every time I came to a stop, the weak yellow glow of the headlights would blink in unison with the rough running engine. What had I gotten myself into! 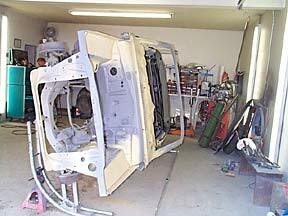 "Every week or two I would drive over to the shop and check on the progress, and make a payment (ouch!). One thing led to another, and you might as well fix it right while it's apart, so we systematically disassembled the car down to a mere skeleton. Sandblasted off four coats of paint. Put the car on a rotisserie and did the bottom as well. It was my job to scour the country in search of replacement parts. Replacement rear quarters and front fenders from Arizona, wheels and interior pieces from Oregon, exhaust system, front-end parts, on and on. It was scary! I've discovered if you watch Ebay long enough, all things will come to you. "Meanwhile, the engine and transmission were rebuilt. The front seat was re-upholstered. I ordered all kinds of rubber weather-stripping and parts. Gary Goers is a great supplier for these things. The car started to take shape again. I didn't feel so bad anymore. Once the paint was applied, it really started to become a work of art. It was in the body shop for about eighteen months. I had it delivered to my home on a flatbed truck (still no brakes). I then went about the task of reinstalling the interior, rebuilding the brake system, replacing the rear springs, installing the new tires and generally working out all the bugs to get it running again. "Since completing the car, I've driven about 3000 miles. In 2001 I received first place in my class at an Antique Auto Club of America show in Rhinebeck, NY with over 1000 cars present. In 2002, I received the President's Choice award at the AACA Central Connecticut Region's show. Also in 2002, I received first in class at the Northeast Chrysler Convention. It's nice to have recognition for all the hard work and craftsmanship that's gone into this car, but the best part is putting the top down and cruising the back roads of Connecticut, watching people smile and wave. And of course, meeting all the great EVBC members!" "I'd like to thank everyone for the kind words and concern extended to myself and family after the recent fire. Right now I don't have any plans to restore the Valiant. After spending so much time and effort on the car over the past 5 years, it's kind of hard to think about doing it again. Maybe it's too soon to make a decision. I will remain a member of the EVBC because of all the great people here. 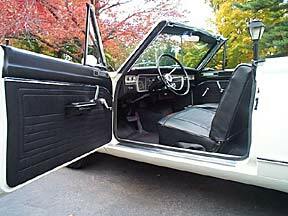 Burnt 1966 Valiant Signet convertible"
"I moved back into my home Thanksgiving weekend. It's like moving in for the first time, everything is still in boxes. The restoration work done on the house came out excellent, the house is better than before the fire. I'm not ready to replace the Valiant yet, but I do scour Ebay and the local classifieds. Ya never know when the next project will show up!" Best of luck to ya, Don- we're happy things are turning out OK. May your next project be even more rewarding (and less frustrating) than your previous one!